To be honest, Windows 10's volume controls aren't that special. You can set the volume for the default speakers you're listening to, you can change your default speakers (from your monitor's crappy built-in speakers to your awesome headphones, for example), and... that's it. Sure, Windows 10 comes with more advanced audio controls if you want to fine-tune your audio setup, but they're a bit buried. Given how many of us are a little lazy with our computers — myself included — we probably don't think, "Hey, I should go manually assign this app's sounds to my headphones" when trying out a new game or program. So this feature probably goes unused, if not forgotten entirely. The recently updated Windows app EarTrumpet - now on version 2.0 - blends these two worlds and is a must-have replacement for Windows' taskbar audio controls. With it, you get a prettier view of the sound that's coming out of your various audio devices. If you want to get fancy, you can also easily reassign different apps to different audio outputs - so your Spotify always blasts from your primary speakers and your favourite game pumps out of your headphones (if it works). Since the app is a Windows Store download, installing it is easy. 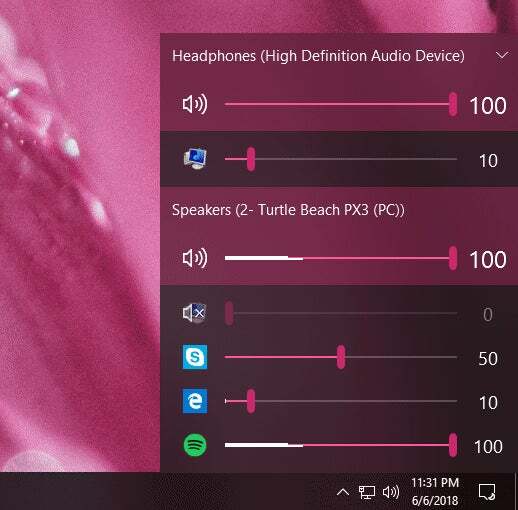 Once you've launched it, look for the audio icon in Windows 10's notification area — the lower-right corner of your screen, assuming you haven't moved your taskbar to the top or sides of your desktop. Don't click on the regular audio icon that will also be there. Hover your mouse over the audio icons until you find the right one for EarTrumpet, and then click on that. Boom! 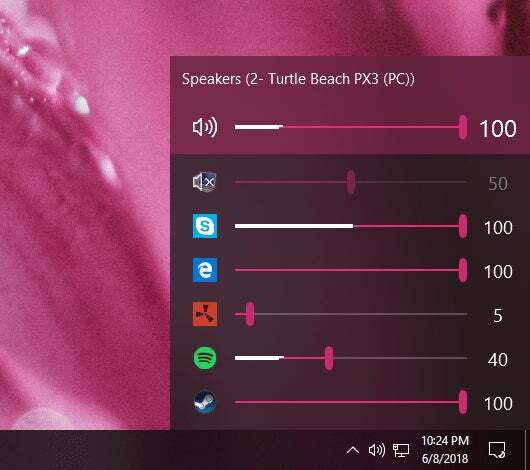 Each of your audio outputs fills the side of your Windows desktop, along with every app that could use each audio output to blast noise your way. If you're currently streaming music or listening to a YouTube video, for example, you'll see little indicators below the app to show what's coming out of the left and right mix. Oooh. Ahhh. Right-click on an app, and you can then click on the icon that looks like two arrows pointing in the opposite direction to reassign the app to another audio output. This works well in some apps (like Spotify), but not so well in others (Steam games). In some cases, you might have to restart your app to get your new audio preference to take effect. In others, you might just be out of luck. It's OK. Audio can be finicky. Even if this last bit doesn't work or is too annoying to customise for all of your apps (I would have preferred some kind of drag-and-drop functionality), EarTrumpet at least gives you an easy way to manage volumes on a per-app basis. And if you want to just switch everything from one audio output to another (speakers to headphones, for example), right-click on the EarTrumpet icon and select a new output. Easy. If you're sold on EarTrumpet, you're going to want to do a little more configuring to make it look and feel like Windows 10's old volume icon — and ditch the latter for good. 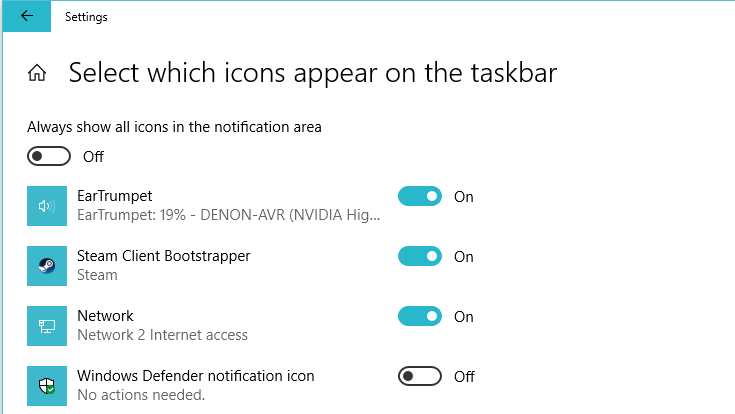 Right-click on your Taskbar and select "Taskbar settings." Scroll down to the "Notification area" section and click "Turn system icons on or off." In the screen that appears, deselect the option for Windows 10's volume controls and click the back arrow in the upper-left corner. Then, click on "Select which icons appear on the taskbar." On this screen — assuming EarTrumpet is currently running — find the app and flick the switch to "On," which will sticky it in your notification area. I have an Intel Display Audio device (plays though monitor) and a RealTek High Def Audio device (listed when i right click on the EarTrumpet icon), but i cant seem to do the right click on an app to reassign what device plays what app, which was the main reason i installed it, although faster access to the mixer functionality that's been around for donkeys years is nice. Not that i would want anything to use my monitor speaker, just wanted to test it before buying anything new. Oh sorry you meant that differently. It still relies on your default audio device so it probably can't do what you want.